From deliciously tart daiquiris to sorbet-like mocktails, here are are nine fantastic drinks to make with summer raspberries. 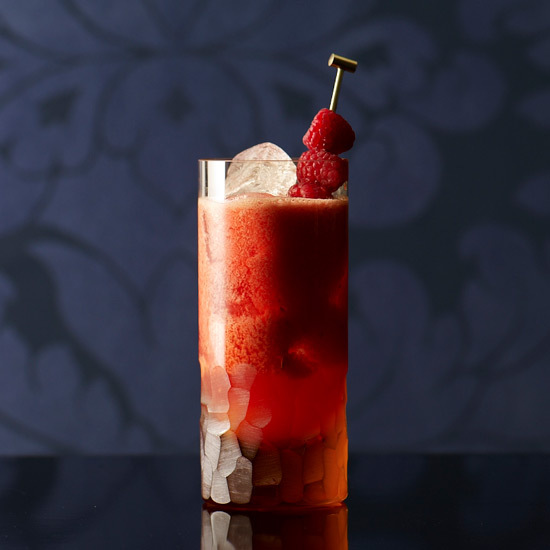 "It's the liquid version of raspberry sorbet," says mixologist Sebastian Reaburn of this delicious beverage. This bubbly virgin drink is made raspberries and strong green tea. For an alcoholic version, use raspberry vodka instead of club soda. Raspberry-flavored lambic (a type of wheat beer), raspberry liquer and chilled Prosecco make the ultimate red cocktail. This Irish whiskey cocktail features an easy raspberry cordial. For a fun take on the Moscow Mule (vodka, lime juice and ginger beer), add raspberries and balsamic vinegar. A simple syrup made from fresh raspberries flavors this terrific bourbon-grapefruit drink. Muddled rosemary adds fantastic herbal flavor to this raspberry-vodka cocktail. This fantastic version of the classic fruity cocktail is not overly sweet thanks to a combination of tangy raspberries and tart pomegranate molasses. Chef James Holmes topped raw oysters with this sweet-savory sorbet before deciding it would make an excellent cocktail with Prosecco.